Metro fruits are always fresh. With rich fruit varieties Metro is perfect choice for fruit shopping. In Metro Fruit Festive Flyer 2 – January 2016 they publish wide variety about fruits. They are discounted more than any other product. And small box raspberries, blueberries and blackberries from Chile and Mexico. They came from away but still fresh at Metro rayon. They are just $2.99. Great offer by Metro. 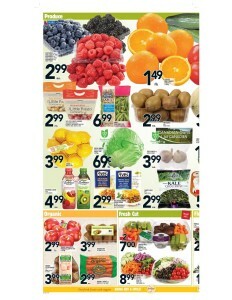 My favorite fruit is strawberries almost 500g strawberries price is $2.88. Always tasty and cheap. Costa Rica is perfect place for grown banana. Metro bananas coming from there. As you can see their yellow color how its vivid ! Avocados arrived to store just two days before. Before finish, buy a couple of avocados for healthy life. Metro collecting best fruits all around of world. Fruits are coming weekly and always stayin fresh. Kids never likes seeds, but these seedless oranges they will like it. Also you can buy from internet. Metro official webside features to buy faster and safety. You can reach more products at catalogue. Do not wait in line. Just add to list and buy for yourself ! Keep your health high with Metro products. Take a healthy decision with metro weekly flyer.